The Maritime Labour Convention 2006 (MLC) has forever changed the way vessel operators look at healthcare for the world’s 1.3 million mariners. For some, it means simple com- pliance with a minimum set of standards and managing the costs associated with that standard. For others, MLC is a call to arms for those who work to make sure that healthcare at sea means more than just emergency telemedicine services. 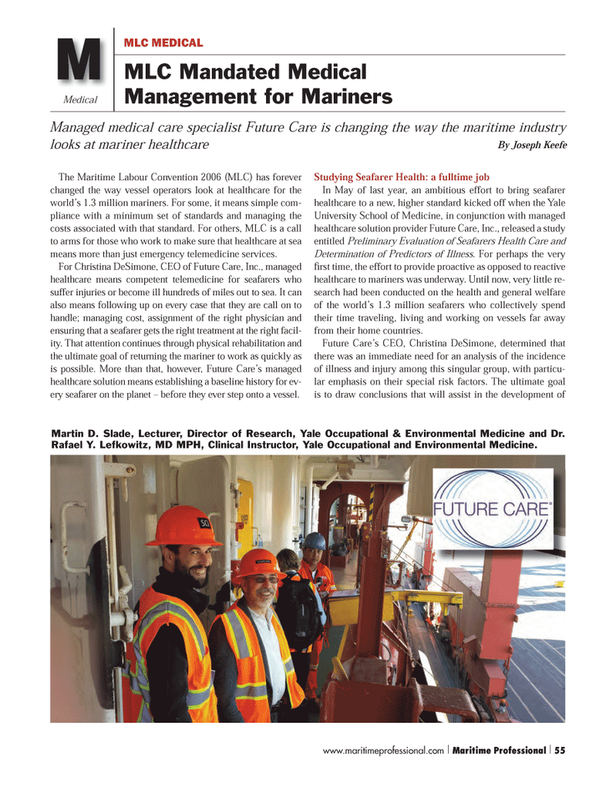 For Christina DeSimone, CEO of Future Care, Inc., managed healthcare means competent telemedicine for seafarers who suffer injuries or become ill hundreds of miles out to sea. It can also means following up on every case that they are call on to handle; managing cost, assignment of the right physician and ensuring that a seafarer gets the right treatment at the right facil- ity. That attention continues through physical rehabilitation and the ultimate goal of returning the mariner to work as quickly as is possible. More than that, however, Future Care’s managed healthcare solution means establishing a baseline history for ev- ery seafarer on the planet – before they ever step onto a vessel. Determination of Predictors of Illness. For perhaps the very fi rst time, the effort to provide proactive as opposed to reactive healthcare to mariners was underway. Until now, very little re- search had been conducted on the health and general welfare of the world’s 1.3 million seafarers who collectively spend their time traveling, living and working on vessels far away from their home countries. Martin D. Slade, Lecturer, Director of Research, Yale Occupational & Environmental Medicine and Dr.